From the relatively obscure American species of our June report, we turn this month to an Establishment figure among the large-flowered hybrids. 'Mrs. 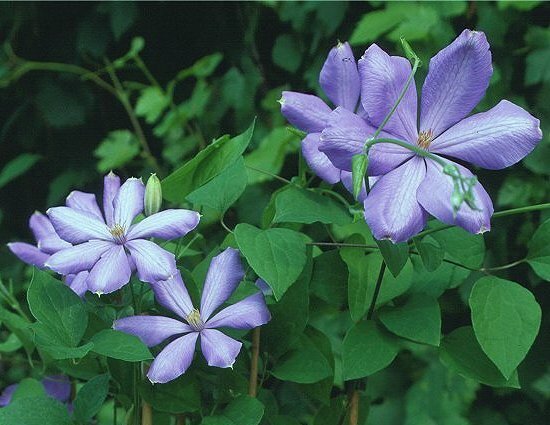 Cholmondeley' is one of the most instantly recognizable of clematis because of the pinwheel look of its big blue flowers, with the noticeable separations between the sepals that used to be disparaged in some quarters as "gaps." As with its near-contemporary 'Gipsy Queen,' the gaps may in fact have added to the distinctive appeal of the plant rather than detracting from it. 'Mrs. Cholmondeley' has a slightly unusual advantage in the marketplace, in that its very name puts people in a good humour. Nearly everyone who isn't British, or aware that the name has wandered through at least four hundred years of local history, gets it wrong at first and has to be told to say "Chumley." How like the British, we say, though of course anyone who has ever heard a Dane pronounce "Frederikshavn" or a Washingtonian say "Sequim" knows the tendency is somewhat more widespread. In any event, it is safe to assume that many a 'Mrs. Cholmondeley' has been taken home on the strength of the name alone. From the start, however, this cultivar is of interest for other reasons. Once in the ground, it is usually a quick and dependable grower to 8'-10' (2.5-3m) or morereportedly to as much as 17' (5m) in time if left forever unpruned. It is ready to bloom early even if it has been fairly heavily cut back, and able to keep the flowers coming over many weeks. Gardeners have the option of hard-pruning it (as for Group 3 or C) if they want to defer bloom until early summer, and that could be the right move if the sometimes very large first flowersup to 8.5" (22cm) would be out of scale with their surroundings. Later flowers are ordinarily of more modest dimensions, though in truth 'Mrs. Cholmondeley' would never be mistaken for a shrinking violet. The breeder was Charles Noble, whose Sunningdale Nurseries sent out some of the best large-flowered clematis in the wonderfully productive last thirty years of the nineteenth century. C. 'W.E. Gladstone' was his, and 'Daniel Deronda' and 'Jackmanii Alba' and 'The President,' to name no more. His 'Mrs. Cholmondeley' came along in 1873, from a cross between C. 'Fortunei' and C. x Jackmanii, and that parentage is a clue to something that could happen unexpectedly with this plant. The flower of 'Mrs. Cholmondeley' is customarily said to consist of six or seven lavender-blue sepals. But one learned report from Latvia describes it as double, at least in the Spring. Pursuing this, since it did not correspond to our experience, we recently put the question to our Registrar, Victoria Matthews, who assembled a blue-ribbon panel of experts by e-mail, and handed the question along to them. Most had never observed the plant to flower double, but three had noted at least extra sepals, fully or partially formed, in one year or anotherhence, evidence of a variable trait. As it happens, this could easily be a direct inheritance from one of the parents. C. 'Fortunei' (now extinct) was an important carrier of the doubling tendency. So if a plant of 'Mrs. Cholmondeley' with a history of single bloom should open some year with an extra fund of sepals, few or many, it should be enjoyed simply as a trick of its ancestry, for it might not happen again. Or we could move to Latvia. Unusual and temporary semidoubling may occur now and then with other familiar cultivars, such as 'Ville de Lyon,' 'Henryi,' and 'Ernest Markham.' The genetic make-up of such hybrids can be very complex, leading them to react unexpectedly to differences in their growing conditions that are too subtle or too gradual for us to notice.